COLUMBIA, S.C. – For their years of service to the University of South Carolina’s libraries, Reece and Nancy Williams were presented with honorary life memberships in the Thomas Cooper Society at the society’s Annual Dinner recently. 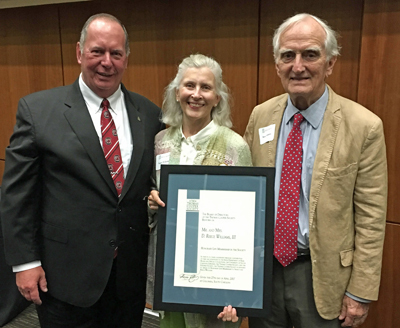 Reece and Nancy Williams were honored for their many years of dedicated support for the University Libraries, the Irvin Department, the Thomas Cooper Society, and the Ex Libris Society. Even after all those years of service, the honor “came as a surprise to me,” said Reece Williams. Novelist and poet Ron Rash was the featured speaker at the dinner, and he was awarded the Thomas Cooper Medal. The first recipient of the medal was the late Pat Conroy. Other medalists include William Styron, Derek Walcott, Joyce Carol Oates, Edward Albee, and Doris Kearns Goodwin. Rash’s novels include Saints at the River, The World Made Straight, Serena and The Cove. He is also respected for his poetry and short stories. The University of South Carolina Libraries are ranked 34th by the Association of Research Libraries among U.S. public libraries and are the only ARL member in South Carolina. The libraries include the historic South Caroliniana Library, which recently celebrated its 175th anniversary; Ernest F. Hollings Special Collections Library; Music Library; Moving Image Research Collections; and Thomas Cooper Library, a seven-level facility with 290,000 square feet of floor space that is open 24/7 to students. Scholars from the around the world seek the libraries’ holdings, which include comprehensive collections of F. Scott Fitzgerald, crime fiction writers Elmore Leonard and Dashiell Hammett, natural history, astronomy, newsfilm, and state political leaders. Reece Williams III is a member of Callison Tighe law firm. A litigator who’s often called upon to teach advocacy skills to others, he focuses his practice on trial work. He’s experienced in areas including personal injury, professional liability, commercial and government litigation. He is also a certified mediator and arbitrator. He has long been active in organizations devoted to furthering the legal profession. He was national president of the American Board of Trial Advocates in 2000 and president of the Richland County Bar Association in 2002. He’s also long been a leader in the Columbia community beyond the legal field. Among his many affiliations in the community, he is past president of the Ex Libris Society and past president of the Thomas Cooper Society.